This is Mechanical engineering major project report on "design optimization of crane hook using Ansys". The objective of this final year project is to discover the causes that led to a failure of the crane hook in service. The causes of failure are stress concentration, material of hook, manufacturing process of crane hook, wear, plastic deformation due to loading, and continuous use of crane hook may accelerate the failure of crane hookYou can also subscribe to FINAL YEAR PROJECT'S by Email for more such projects and seminar. Crane Hooks are highly liable components that are typically used for industrial purposes. It is basically a hoisting fixture designed to engage a ring or link of a lifting chain or the pin of a shackle or cable socket and must follow the health and safety guidelines. Proper design, careful forging, and precision controlled quench and tempering give maximum strength without excessive weight. 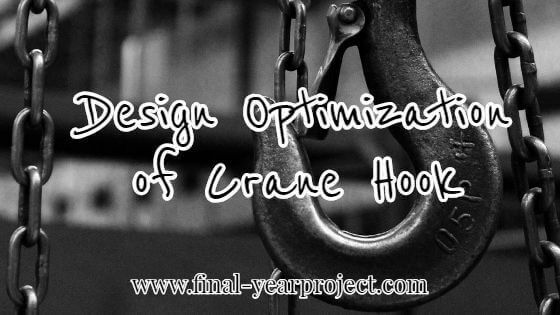 In this project, ANSYS software is used for design optimization of crane hook. For optimization, it is important to produce an optimized preliminary design (with minimum weight). A plethora of random designs are generated by varying the values of the design variables within the specified limits till optimized design has been reached. The results of before optimization and after optimization are compared and verified. The optimization of the crane hook also establishes the reduction in the weight of hook. That reduces the cost of the crane hook by saving the material. ANSYS is developed by ANSYS, Inc., USA, and is a dedicated Computer-Aided Finite Element Modeling and Finite Element Analysis tool. The objective of this work is to identify the causes that led to a failure of the crane hook in service. The causes of failure are stress concentration, the material of hook, manufacturing process of crane hook, wear plastic deformation due to loading, and continuous use of crane hook may accelerate the failure of crane hook. In this project, the author has constructed a FEM model of the crane-hook based on one of its actual design. The FEA results of the Crane Hook have been analyzed and compared with the available results for Analytical calculation result. This project also explains about Computer Aided Design (CAD), different types of hook, Computer Aided Engineering (CAE), Computer Aided Analysis (CAA), fundamental of CAD systems, application area, etc. Thanks to the author of this project. Please don't forget to show your love by sharing this project.